Showcased at the CES tech show in Las Vegas last week, the unusual device features built-in microphones for active voice suppression. What’s more, ‘voice masking mode’ enables the user to choose from a selection of audio affects including Darth Vadar, R2-D2 or a Minion. There are also some nature-based tones, including the ocean, birds and squirrels. The strange gadget is the work of a group of US-based Ukrainian designers. 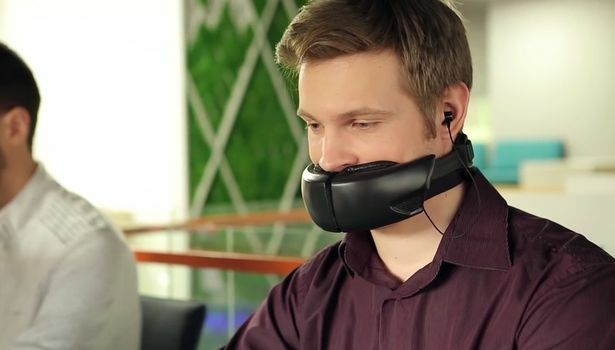 A promotional video shows an office worker donning the muzzle-like device while making a short phone call before removing it from his face and casually resting it around his neck. The Hushme is expected to come with a price tag of around £165 ($200) though no release date has been given. The makers are hoping to gather the necessary cash for a product launch using a crowd-funding site.